Teach Kittens Gentle Play? Yes you can! What does Fear Free look like at Milford Veterinary Hospital? 'Introducing affordable preventive care plans for pets. Ask us today what a preventive care plan can do for you! 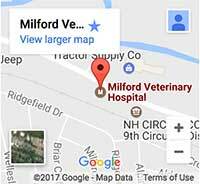 Milford Veterinary Hospital is proud to serve Milford, NH, and surrounding areas. We are dedicated to providing the highest level of veterinary medicine along with friendly, compassionate service. If you have any questions about how we can care for your pet, please don't hesitate to call us at (603) 673-6101. Thank you! Best of the Souhegan Region Since 2007! Milford Veterinary Hospital Copyright © 2019.